The Espresso Bar at the Melbourne Marriott Hotel has come a long way since its watered-down coffee days in 2008. The relaunched five-star Melbourne Marriott Hotel has been serving up a feast of fresh changes at Espresso Bar since July 2012, with the introduction of Italian barista Alfredo Scrivano and new menus. The small cafe offered a simple yet stylishly contemporary decor with comfy armchairs and a long counter set against large windows for natural light and people watching. The entrance from the street offered a delicious view of pastries, Wega coffee machine and the Essence on Exhibition Restaurant in the background. Alfredo, the friendly barista and the service staff were eager to please. George Varughese, General Manager of the hotel understands that Melbourne is a city with a competitive coffee and dining scene. Therefore it is necessary for the Espresso Bar to keep up with artisan brewers like Market Lane and Sensory labs, and cafe offerings in hotels like Westin Melbourne, Intercontinental The Rialto and Grand Hyatt. Alfredo, the specials and new menu are indications that Espresso Bar is always innovating and better serve customers. 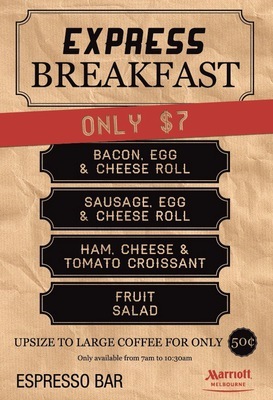 Examples include the cafe's AUD5 coffee and muffin deal and express breakfast menu. Recognising its location in the heart of the city's commercial, theatre and shopping district, the Espresso Bar is an ideal stop for quick brekkies and bites. 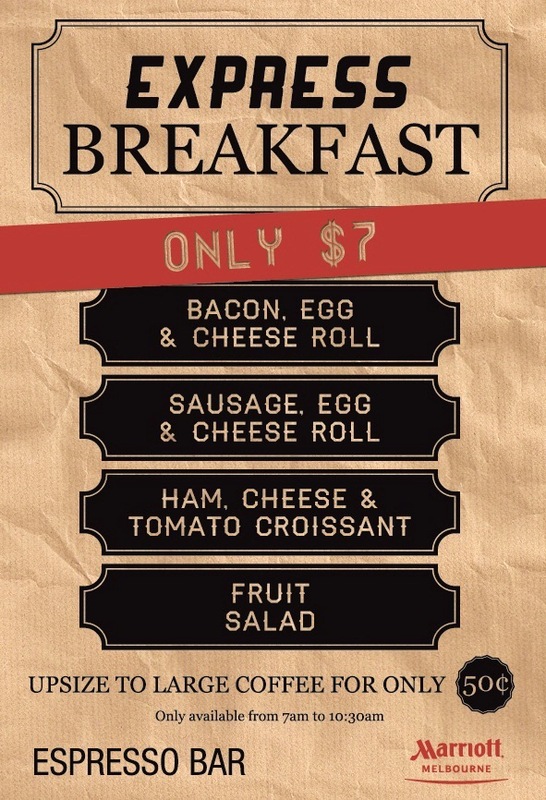 It's AUD7 express breakfast menu with the option of an up-sized coffee at AUD0.50 caters directly to customers on route to work or shopping. The cafe also offers a neat selection of snacks, sandwiches, pizzas and light meals that are ideal for short lunches and afternoon nibbles. I ordered a latte and it arrived in the custom-designed Ceramica of Manfredi, accompanied by two dainty cookies. The association with Espresso di Manfredi provides some assurance of a great coffee experience as set by the coffee merchant's quality guidelines and taste fine tuned to the Australian palate. With Alfredo's 20 years of European coffee-making experience and barista skills, the result was a satisfactory dark chocolaty crema and full bodied finish that surpassed other cafes in Melbourne like Coffea near Queen Victoria Market and Brunetti in Carlton. Stealing a glance of the menu from the neighbouring Essence on Exhibition Restaurant, I was attracted to the chocolate fondant and cheesecake, which I previously heard were best sellers. Instead of requesting my move to the restaurant, the waitress Anita organised for both deserts to be served to me in the cafe thereby receiving my kudos for excellent personalised service on the part of Melbourne Marriott. The hot chocolate fondant arrived in the company of an orange sorbet and a salad of grapefruit and strawberries. A spoon of the chocolate fondant immediately explained the popularity of this desert with diners. The baked dark coverture chocolate was fluffy with light gooeyness and without being too sweet on the palate. I've added this to my list of chocolaty favourites alongside the Lindt chocolate and masala cake at Cafe de Beaumarchais in Mount Dandenongs. The baked cheesecake with mango salsa and butterscotch crisp was a delightful mixture of dense yet crumbly cheese that wasn't overpowering but lightly salty sweet on the palate. It definitely wasn't your conventional soft creamy cheesecake available in most cafes. The next time you're in the vicinity of the Melbourne Marriott Hotel, do check out the Espresso Bar, the munchies and Alfredo's coffee. Well this experience differed greatly from mine this past weekend. My friend and I decided to sit in the restaurant adjacent for breaky. We had to repeat a macchiato order 3 times to the waitress who eventually came back again ask us to repeat the coffee order. When mine came out, the cup was streaked with coffee drips down the side. And our poached eggs couldn't be eaten as they were cold and so runny they were still raw!!! We were offered a replacement but opted for pancakes instead as a safer alternative. I def won't be rushing back there.